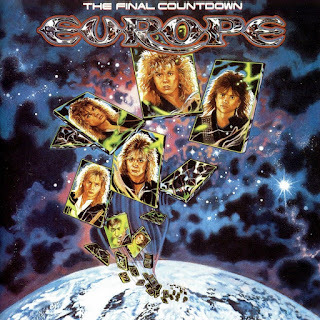 One of the most glorious launches in history, the title track for the thrice-platinum The Final Countdown is so bombastically brilliant, such glorious garbage, that this nuclear hair assault could only spew from the vacuous '80s. But the full-tilt follow-up "Rock the Night" rules also: "You know it ain't easy/Running out of thrills." "Carrie" comes off a consummate butane ballad. Meanwhile, the rest of the disc packs so much power that Swedish superheroes Europe get away with all the processed pretension. In fact, the lofty ambition of "Danger on the Track," "Ninja," and "Cherokee" (each as tasty as its title) combines with heated drive and hot delivery to meld The Final Countdown into a unique portrait of propulsive prog and a worthy addition to any hard rock collection. This is the story; this is the legend told by Teutonic guitars and predictable keyboards ringing pure and hurtling through each and every convention perfectly. The quintet's big-boy Epic inaugural, The Final Countdown deftly combines the Valhalla victory of Europe's heroic debut with the American poodle pomposity that devoured the band. You could live without The Final Countdown, but why?